This morning, I, thinking myself quite the clever “preschool homeschool mother”, got out a big bag of various buttons and my muffin pans. 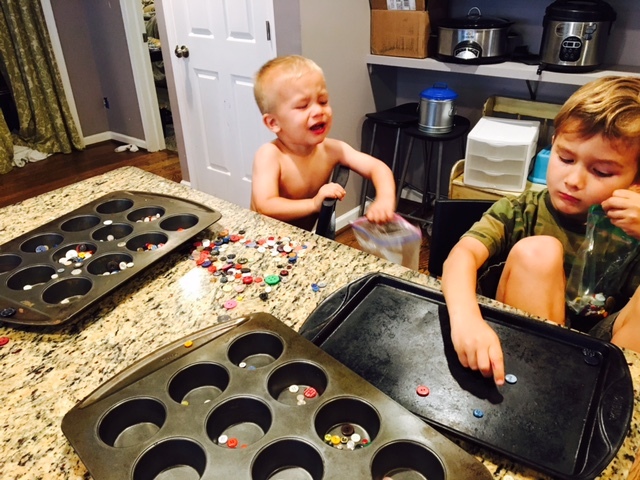 I doled out large piles of buttons to my two and four year olds and showed them how they could sort them according to color or size in the different muffin holes. Win! I just bought myself some more time to “succeed” in getting the kitchen cleaned up from breakfast and get laundry started before I sat down to nurse the newborn and read the boys books. At least I THOUGHT I bought more time. What transpired before me merely gave me more to tend to in my children, in my home and in my own heart. The two boys had a very similarly eclectic mound of color and size. The two boys could have similarly delighted in investigating each’s mound. 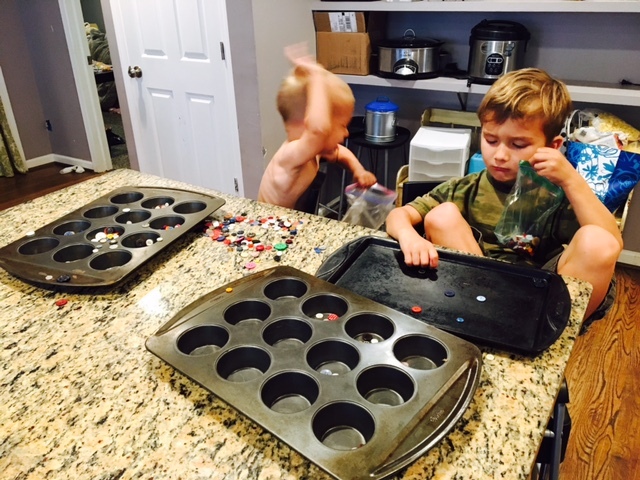 The two boys could have similarly filled the muffin pans with different categories they discovered. One boy was busy doing just that, and enjoying himself in the process. The other boy chose to overlook his own mass of color and wonder and creativity potential, and stare at his brother’s pile…. 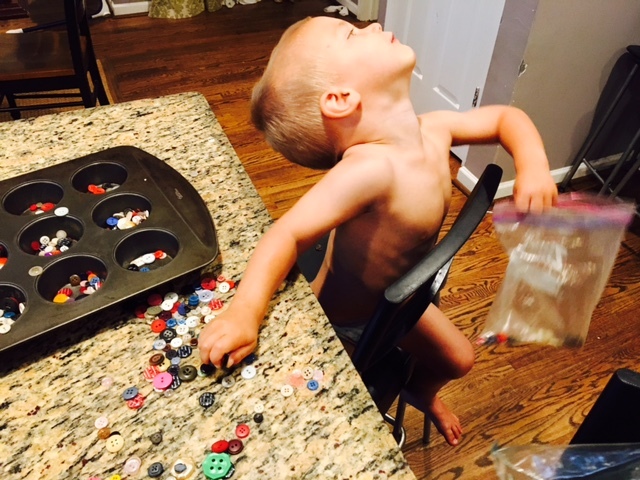 I scurry up the stairs, arms laden with laundry, to discover voices yelling, arms swinging, buttons flying, and a two year old franticly grabbing for any button NOT already in front of him. All this was so amusing and instantly heart penetrating, I actually was able to get pictures of it…aren’t you glad? I had a good laugh just posting them. 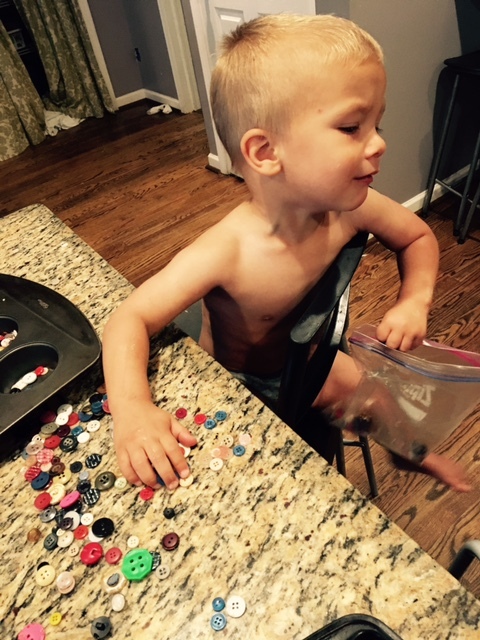 But back to the heart of buttons, a two year old’s desires, and…..our hearts. Oh, the blessings that the Father of Lights, the Giver of good gifts lays before us! Oh, the talents and abilities and possibilities He entrusts to us! Oh, the time, treasures, and heart contentment we waste away when we get suckered into looking at the pile of opportunities, abilities, blessings and successes that someone else has, when we have not even looked at, used, and managed what is right before us. 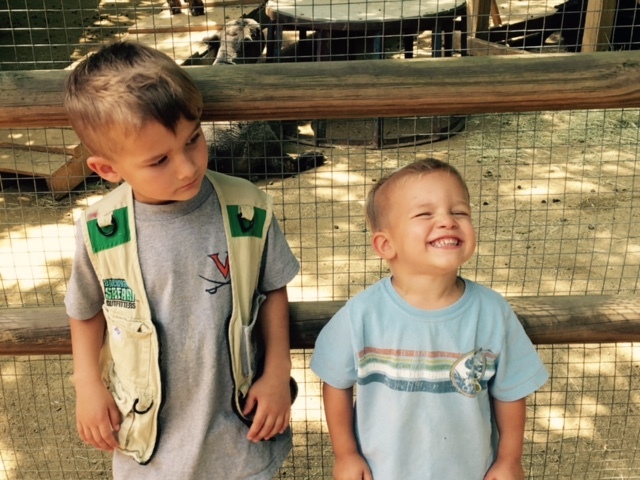 Being a mother of many, with a perpetually messy house, and a tardy arrival, and a worn-thin energy level, it is quite easy to look at those around me and wish I was more…. more successful in ministry, family life, blogging…anything. And in pondering these struggles while sweeping up buttons scattered across my already-swept-once-this-morning floor, the Lord so graciously spoke into my own adult-button-grabbing tantrum. And I can be thankful that, once again, the Lord of All uses parables, the parables laid out for me in my own home life with children to teach truth to my heart. Truth that brings freedom. Freedom to be content with what I have, rather than strive for what I don’t. Freedom to enjoy what has been entrusted to me, rather than long for what hasn’t. Freedom to give thanks in all circumstances, rather than strive to control all circumstances. Freedom to celebrate the little victories and successes, rather than tantrum over the failings and shortcomings. rather than try to make myself into what I think I should be.